The island of Oahu, home to Hawaii's capital, Honolulu, is the first stop on most Hawaiian vacation itineraries. The island has a lot to offer visitors, including magnificent white sand beaches, stunning sunsets, amazing historic landmarks and unprecedented cultural wonders. With so much to see and do, it helps to plan your trip in advance with the help of an Oahu travel guide. One of the most famous beaches in the world, Waikiki is an active public beach that extends for miles along downtown Honolulu's waterfront, from the Ala Wai Canal all the way to Diamond Head. Waikiki is full of activity, and visitors can rent windsurf boards, catamarans, and canoes from vendors on the beach. This is also a great beach for beginning surfers, as the waves roll gently onto shore. Before Hawaii became the United States' 50th state, the islands were ruled by the Hawaiian royal family. The gracious Iolani Palace, constructed in 1882, was the official residence of King David Kalakua and later, Queen Lili'uokalani. It is America's only royal palace and shows the Hawaiian monarchs' obsession with all things European. This carefully restored residence features Douglas fir wooden floors, French-style carved moldings, and ornate, gilt furniture. Today, the lovely home is dedicated to preserving Hawaiian culture. You can take a quilting class here or listen to a Hawaiian concert in the manicured, tropical gardens. Diamond Head State Monument, the looming volcanic crater that dominates the Honolulu skyline, is one of the most recognizable landmarks in Hawaii. Its 760-foot high slopes are one of the first sights Hawaii travel visitors see of the islands. Named by early white settlers who mistook the crater's sparkling rocks for diamonds, Diamond Head is a scenic spot for a leisurely hike, a picnic lunch, or an escape from the bustle of the nearby city. Just outside of Honolulu and still a working naval base, Pearl Harbor will forever be remembered by Americans as the site of the terrible and tragic attack on December 7, 1941. 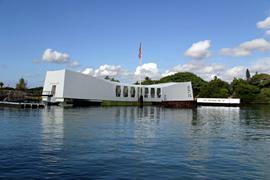 Today, visitors can take a brief boat ride out to the Arizona Memorial, built atop the S.S. Arizona, still located just under the water, and the final resting place of over 1100 officers and sailors. The memorial is a solemn and thought-provoking tribute to the lives lost there. On land, a visitors' center tells the story of that fateful day. Featured on Baywatch and the Fox TV series North Shore, Oahu's North Shore is home to some of the most challenging surf in the world and an essential addition to any Hawaii travel itinerary. Sunset Beach, along this coast, is home to the infamous, Banzai pipeline, a breaking, rolling wave and reef combination that surrounds surfers completely in a wave. This area is also home to a number of international surfing competitions. Surfing here is best left to the experienced, and you'll find the best-of-the-best here. Grab a tropical libation and take in the rugged sea views and the exciting surfing action. Also, no Hawaii travel plans would be complete without a visit to the Polynesian Cultural Center. Located about an hour's drive outside of Honolulu, this fascinating complex is well worth the trip. This 42-acre park takes visitors inside seven carefully recreated and authentic villages representing the different cultures that came together to populate the Hawaiian Islands. There's a Samoan, ancient Hawaiian, and Tahitian village, among others. See poi being pounded by hand or tree back transformed into tapa cloth. An IMAX theater, musical presentations, and dance exhibitions help to illustrate the diverse cultures. Ala Moana Hotel: This 1,152-room hotel is prized for its incredible location to spectacular beaches and world-class shopping. In addition to its massive suites, the property also boasts affordable standard rooms with access to a gorgeous pool and sun deck. The hotel sits just steps away from Ala Moana Beach and Hawaii's largest mall, Ala Moana Shopping Center. 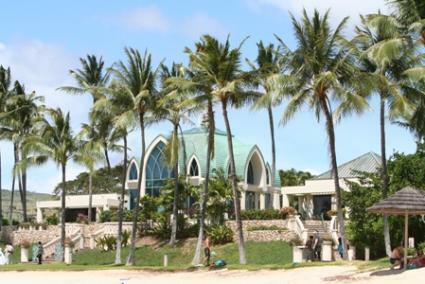 Halekulani: In Hawaiian, Halekulani translates to "house befitting heaven." The description is spot on as this luxury resort sparkles on five acres of prime Waikiki beachfront. More than 90 percent of the resort's rooms face the ocean. In addition, the property boasts a top-rated restaurant, open courtyards and lush, tropical gardens. Turtle Bay Resort: If you don't want to stay in busy Waikiki, then book a room on Oahu's picturesque North Shore. Turtle Bay Resort boasts a spectacular location on the beach and stretches for more than 800 acres. The property is loaded with activities for guests of all ages, including scuba lessons on its secluded white sand beach. Alan Wong's Restaurant: Home to the culinary creations of Hawaii's premiere chef, Alan Wong's is known for serving up some of the best Pacific Rim cuisine in the world. The restaurant is always crowded with locals and visitors alike all jostling to sample such delicacies as Kona lobster and ginger-crusted fresh onaga. Shrimp Trucks: These popular food trucks serve up the sweetest, juiciest shrimp in the state. Most of them park along the beaches on Oahu's North Shore, though some service downtown Honolulu. They are the top pick for delicious cheap eats. Luau: You can't visit Hawaii without experiencing a traditional luau. Most of these local buffets are hosted by area hotels and resorts and include a taste of the Islands ranging from kalua pig and poi to lomi salmon and coconut pudding. When planning a trip to Oahu it is vital to allow yourself time to explore all the island has to offer. For many the prospect of covering the entire island in a single visit is a bit daunting. To aid you in your explorations and help you devise a master plan, visit Hawaii's official tourism site.